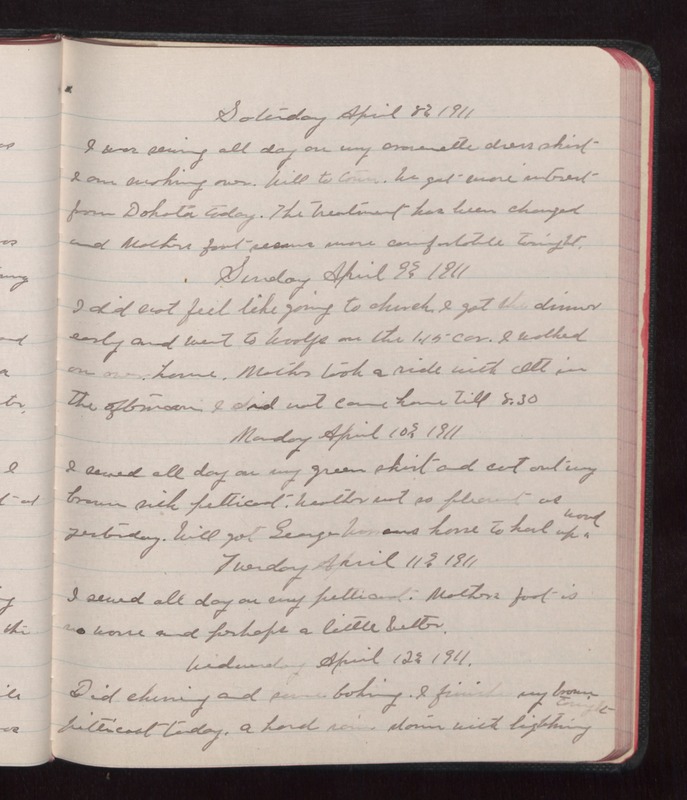 Saturday April 8 1911 I was sewing all day on my [illegible] dress skirt I am working over. Will to town. We got more interest from Dakota today. The treatment has been changed and Mothers foot seems more comfortable tonight. Sunday April 9 1911 I did not feel like going to church. I got the dinner early and went to Woolfs on the 1.15 car. I walked on over home. Mother took a ride with Ott in the afternoon I did not come home till 8.30. Monday April 10 1911 I sewed all day on my green skirt and cut out my brown silk petticoat. Weather not so pleasant as yesterday. Will got George [Warrens?] horse to haul up wood. Tuesday April 11 1911 I sewed all day on my petticoat. Mothers foot is no worse and perhaps a little better. Wednesday April 12 1911. Did churning and some baking. I finished my brown petticoat today. A hard rain storm with lightning tonight.